As initially described by K. Karre and colleagues in the missing self hypothesis, cells expressing self-MHC class I proteins are protected from NK cells attack. In contrast, reduction in the expression of MHC class I molecules due to viral infection or tumor transformation result in the killing of these “abnormal” cells by NK cells via NK-activating receptors. Thus, NK killing of target cells is determined by both negative signals coming from MHC class I proteins and by positive signals derived from the activating ligands. The bound peptide in MHC class I play an important role in the balanced recognition of NK cells. The peptide stabilizes the MHC complex and interacts directly with the NK inhibitory receptors, thus participating in the determination of the fate of the target cells. In this study we demonstrate that posttranslational modifications such as phosphorylation of the presented peptide altered the ability of NK cells to recognize MHC class I molecules. By using a consensus peptide (QYDDAVYKL) that binds HLA-Cw4 in which different positions in the bound peptide were modified by serine phosphorylation, we observed a reduction in KIR2DL1 binding that led to decreased protection from NK killing. Therefore, it might be possible that alteration in the phosphorylation pattern during tumor transformation or viral infection may result in less inhibition and, consequently, improved NK cell killing. Natural killer cells are lymphocytes of innate immunity capable of killing hazardous cells such as tumor and virus-infected cells (1). This killing activity is mediated mainly by a limited set of activating NK receptors that includes the natural cytotoxicity receptors comprised of NKp46, NKp44, NKp30 (known as the natural cytotoxicity receptor), and the NKG2D receptor (2). In contrast, the killing of normal cells is inhibited by a complex set of inhibitory receptors that are present on NK cells and recognize MHC class I proteins on the cell surface of the target cells (3, 4, 5). In addition, the killing of NK cells is also inhibited in a class I-independent manner by receptors such as the leukocyte-associated Ig-like receptor (6), carcinoembryonic Ag cell adhesion molecule 1 (7, 8, 9), and sometimes even 2B4 (10, 11). Class I MHC-mediated inhibition is mostly achieved via two different types of inhibitory receptors. The CD94/NKG2 receptor family encodes type II transmembrane proteins of the C-type lectin-like family (12). This family recognizes the nonclassical MHC class I protein HLA-E, which contains in its groove peptides derived mostly from the leader segments of other MHC class I proteins (13). The second type of inhibitory receptor family is the inhibitory killer cell Ig-like receptors (KIRs).3 These receptors are type I transmembrane glycoproteins that consist of either two (KIR2D) or three extracellular Ig-like domains (14, 15) recognizing HLA-C, HLA-B, and HLA-A molecules (14, 16). The cytoplasmic domains of the KIR family are variable in length; some receptors have a long cytoplasmic domain with one (KIR2DL1) or two ITIM sequences, and other receptors have a short cytoplasmic domain without ITIM. It has been previously demonstrated that a single amino acid residue determines the specificity between KIR2D and HLA-C, i.e., residue 80 of HLA-C (17) and residue 44 of KIR2D (18). For an efficient inhibition of NK killing, all components of the MHC class I proteins must be included: the H chain, the associate peptide and the L chain β2-microglobulin (β2m) (19). An increasing number of studies indicate that, in addition to the class I MHC residues, the associated peptides are also crucial for KIR recognition (20, 21, 22, 23). Peptides are involved not only in the generation of stable, properly folded MHC class I molecules at the cell surface, but also in the direct binding of MHC class I by NK receptors. Indeed, the crystal structure of KIR2DL1 indicates that it is bound to one end of the HLA-Cw4 peptide-binding groove (22). The D1 and D2 domains of KIR2DL1 interact with α1 and α2 domains of the MHC, respectively, and they also bind the COOH-terminal portion of the presented peptide (22). Thus, although interaction of the KIR receptors can be observed even with “empty” or partially empty class I MHC proteins (17), it seems as if peptides in the groove are able to modulate the efficiency of KIR binding and consequently affect NK inhibition. Indeed, several works have demonstrated that the binding of KIR to HLA-Cw4 possesses peptide selectivity (17, 20). Furthermore, this binding was sensitive mostly to the nature of the side chains at positions 7 and 8 in the bound peptide. Following these observations, in this study, we tested whether phosphorylation of the bound peptide in the MHC class I groove can interfere with its recognition by KIR2DL1. Our main finding is that phosphorylation in position 8 of the bound peptide completely abrogated the binding of KIR2DL1 and abolished the HLA-Cw4-mediated inhibition. Implications for these findings for tumor and virus killing by NK cells are discussed. The cell lines used in this work were the MHC class I-negative human B lymphoblastoid cell line 721.221 and 721.221 cells stably transfected with the HLA-Cw4 (221.Cw4) or the HLA-Cw3 (221.Cw3). The human NK cell line YTS was grown in RPMI 1640 medium with supplements and 10% bovine serum. The generation of a YTS NK tumor expressing the KIR2DL1 protein (YTS-KIR2DL1) was previously described (24, 25). Monoclonal Abs used in this work are mAb mem147 (IgG1), directed against MHC class I molecules; mAb HP3E4 (IgM), directed against KIR2DL1; and the mAbs directed against MHC class I-related chain A and B and ULBP1–3 (R&D Systems). The generation of NKp46-Ig, NKp4630-Ig, NKp44-Ig, CD16-Ig, KIR2DL4-Ig, and KIR2DL1-Ig was described previously (25). Briefly, the sequence encoding the extracellular portion of the receptor was amplified by PCR from cDNA isolated from human NK clones. These PCR-generated fragments were cloned into a mammalian expression vector containing the Fc portion of human IgG1. The construct was transfected into COS-7 cells, and the protein produced was purified using a protein G column. The cytotoxic activity of YTS cells against the various targets was assessed in 5-h [35S]methionine release assays, as previously described (17). Cells were stained either with mAb or Ig fusion proteins. Second reagents were FITC-conjugated F(ab′)2 goat anti-mouse IgG (ICN Biomedicals) or the PE-conjugated F(ab′)2 goat anti-human Fc (Jackson ImmunoResearch Laboratories) directed against mAb or Ig fusion proteins. As stated by the manufacturer, the PE-conjugated F(ab′)2 goat anti-human Fc does not cross-react with bovine, mouse, and horse serum proteins. Monoclonal Abs were used at a final concentration of 3 μg/ml, and Ig fusion proteins at 50 μg/ml. The staining procedure was as follows: 30,000 cells were washed once in FACS medium (1× PBS, 0.5% BSA, and 0.05% NaN3) and then incubated in 100 μl of FACS medium containing either mAb or Ig fusion proteins for 1 or 2 h on ice (4°C), respectively. Incubations were performed in 96 U-shaped plates (Nunc). Cells were then washed twice in FACS medium and incubated on ice for 1 h with the appropriate second reagents. Following the incubation, cells were washed twice, resuspended in 200 μl of FACS medium, and analyzed on a FACSCalibur flow cytometer (BD Biosciences). For preincubation experiments, mAb was preincubated for 1 h on ice, and then the Ig fusion proteins were added for another 2 h on ice. Peptide stabilization of class I MHC on acid-stripped cells. Acid treatment was performed by resuspending 5 × 106 cells in 0.25 ml of 1% BSA and 300 mM glycine-HCl buffer (pH 2.4) for 2 min at room temperature. The suspension was neutralized by adding RPMI 1640 medium. The cells were pelleted and pooled in 5 ml of RPMI 1640 containing 10 μg/ml brefeldin A (Sigma-Aldrich). Two million acid-stripped cells were aliquoted into tubes, centrifuged for 5 min at 3000 rpm, and resuspended with 5 μg of β2m (Sigma-Aldrich) and 1 μg of brefeldin A, with or without 10 μg of peptide (BioSight). The volume was adjusted to 0.1 ml with RPMI 1640. The suspensions were rotated at 300 rpm for 4 h at 25°C, washed once with RPMI 1640 at room temperature, and diluted 1/10 for cytotoxic assay. It was previously shown that phosphorylated peptides are part of the repertoire of Ags presented by MHC class I that are available for recognition by CTLs in vitro (26). Because MHC class I proteins are also important in the inhibition of NK cell killing, it is interesting to test whether phosphorylated peptides would also affect NK cell killing. To study the role of phosphorylated peptides in the recognition of HLA-Cw4 by KIR2DL1, we used a consensus peptide, QYDDAVYKL, which is known to bind HLA-Cw4 (20), and included serine residues at different positions for the purpose of phosphorylation. A panel of eight peptides containing the original peptide, a control influenza peptide, and phosphorylated or nonphosphorylated serine residues at different positions of the original peptide (Fig. 1⇓) were made. The anchor motif for peptides bound to Cw4 was reported to be Tyr or Pro at position 2, Val, Ile, or Leu at position 6, and Leu, Phe, or Met at position 9 (27, 28). Thus, in the peptide studied here the HLA-Cw4 anchor motifs are Tyr, Val, and Leu at positions 2, 6, and 9, respectively and the residues at these positions were therefore kept constant. In all of the experiments performed, the loaded peptides were not toxic for the cells and had no effect on the cellular viability. Peptides used in this work. QYDDAVYKL is a consensus peptide (original) that binds HLA-Cw4 (20 ). The HLA-Cw4 anchor motifs are Tyr, Val, and Leu at positions 2, 6, and 9, respectively. The serine residues indicated in boldface type were introduced in all positions except from the anchor residues and were phosphorylated (indicated with plus sign) or not phosphorylated (indicated with minus sign). The number indicates the position of the serine residue within the peptide. The influenza peptide was used as control. The HLA-C molecule is present on the cell surface in a ternary complex of a H chain, an associated peptide, and a L chain β2m. Acid treatment of 221.Cw4 cells releases the peptide from the binding groove and initiates β2m and H chain dissociation from the MHC complex (19). To generate HLA-Cw4 proteins that are empty or at least partially empty of peptides, we treated the 221.Cw4 with glycine-HCl buffer as described in Materials and Methods. A dramatic decrease in cell surface expression of HLA-Cw4 was observed, as detected by the anti-MHC mAb mem147 (Fig. 2⇓a). Similar results were obtained when we used the pan anti-MHC class I mAb W6/32 (data not shown). This reduction in the conformed class I MHC proteins led also to a sharp decline in the recognition by KIR2DL1-Ig (Fig. 2⇓b). We have previously demonstrated that the formation of complexes of class I MHC proteins increases the binding avidity of the various NK receptors (25). To test whether the generation of empty complexes on the cell surface will result in the recognition of these empty molecules by KIR2DL1-Ig, we cross-linked the HLA-Cw4 molecules by preincubation of the cells with mAb mem147 before staining with KIR2DL1-Ig. The mem147 Ab is not a blocking Ab and could not block the HLA-Cw4 inhibition of KIR2DL1-positive NK clones (data not shown). Indeed, as can be seen in Fig. 2⇓c, preincubation of the HLA-Cw4 cells with mem147 mAb resulted in a significant binding of KIR2DL1-Ig. This increased binding was reduced after acid treatment. However, binding of KIR2DL1-Ig could still be observed even after the acid treatment (compare Fig. 2⇓, b and c). 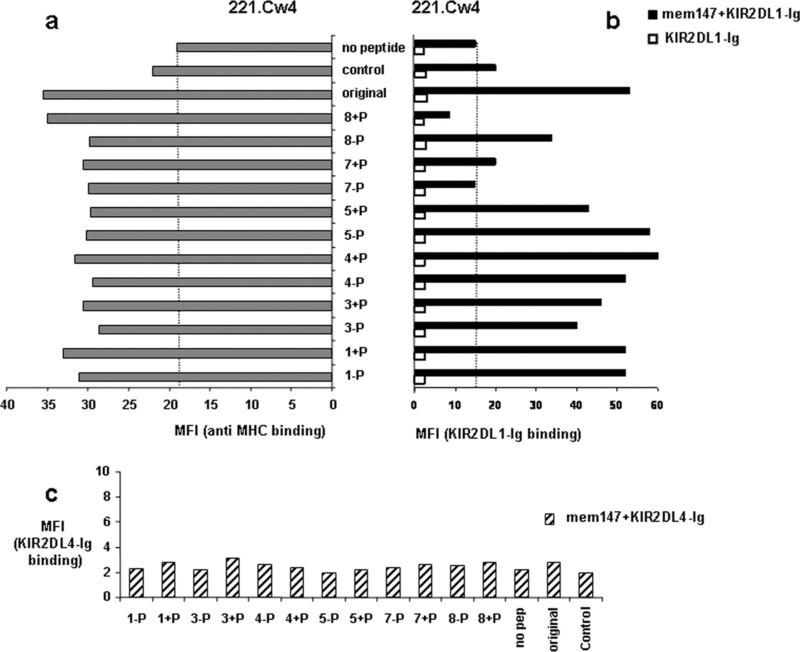 These results indicate that empty or partially empty HLA-Cw4 proteins are recognized by KIR2DL1 and that the conformed class I MHC proteins are much better recognized. Acid treatment-reduced MHC (mem147) Ab and KIR2DL1-Ig binding. a and b, 221.Cw4 cells were treated with acid as described in Materials and Methods. Cells were stained with anti-MHC mAb mem147 (a) or KIR2DL1-Ig (b) before and after acid treatment and analyzed by FACS. c, Preincubation with mem147 enhanced KIR2DL1-Ig binding. BG is the background staining of nontreated cells either with secondary FITC conjugated goat anti-mouse Abs (a) or with PE-conjugated goat anti-human Abs (b and c). The background staining of acid-treated and nontreated cells was similar. The staining presented in the panels was performed at the same time, and one representative staining of five performed is shown. To assess the role of the phosphorylated peptide in the direct recognition of HLA-Cw4 by the KIR2DL1-Ig receptor, we examined the interaction between acid-treated, peptide-loaded 221.Cw4 cells and KIR2DL1-Ig. As a control, we first used HLA-Cw3-expressing cells that were not expected to bind our model peptide. 221.Cw3 cells were treated with acid and then loaded with peptides as described in Materials and Methods. As expected, there was no difference in the binding of KIR2DL1-Ig to acid-treated, peptide-loaded 221.Cw3 cell, with or without mem147 mAb (Fig. 3⇓, right). Furthermore, there was no enhancement in the expression of MHC class I, and, surprisingly, we even observed a reduction in the expression level of MHC class I proteins loaded with the various peptides (Fig. 3⇓, left). We do not completely understand the reasons for this reduction, but this can serve even as a better control for the experiments performed with 221.Cw4 cells, as described below. 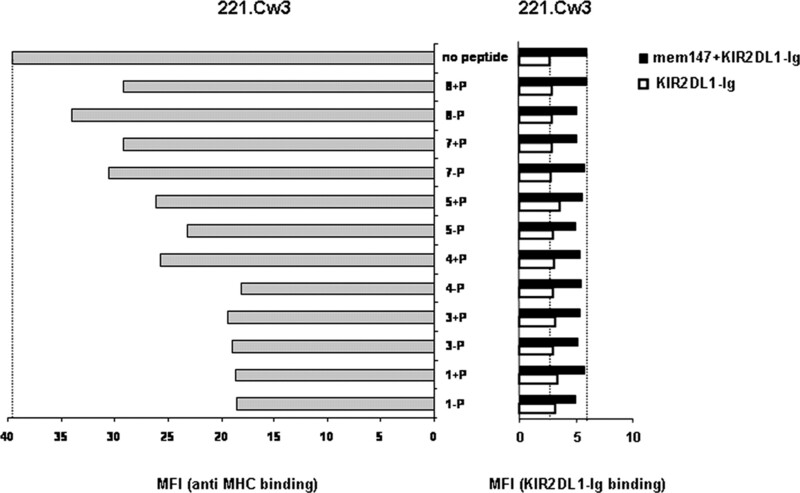 The various peptides are not recognized by KIR2DL1-Ig in the context of HLA-Cw3, 221.Cw3 cells were treated with acid, loaded with peptides as described in Materials and Methods, and tested for the induction of HLA-C surface expression by using mem147 mAb (gray bars in the left panel) or KIR2DL1-Ig binding (filled and open bars in the right panel). 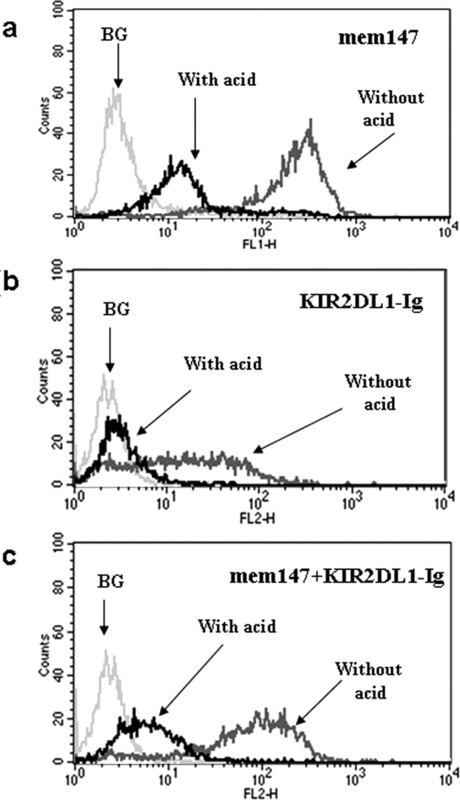 To increase the KIR2DL1-Ig binding sensitivity, the acid-treated, peptide loaded cells were incubated with (filled bars) or without (open bars) mem147 mAb before staining with KIR2DL1-Ig. The vertical dotted line indicates staining of acid-treated cells without peptides. The phosphorylated serine residues are indicated by plus signs, whereas nonphosphorylated peptides are indicated by minus signs, and the numbers indicate the position of the serine residue within the peptide. Shown is the MFI of one representative experiment of five performed. The various peptides bind HLA-Cw4 and are recognized by KIR2DL1-Ig. 221.Cw4 cells were treated with acid, loaded with peptides as described in Materials and Methods, and tested for induction of HLA-C surface expression by using mem147 mAb (a) or KIR2DL1-Ig (b). To increase the KIR2DL1-Ig binding sensitivity, the acid-treated, peptide loaded cells were incubated with (filled bars in b) or without (open bars in b) mem147 mAb before staining with KIR2DL1-Ig. For the control we used 221.Cw4 cells loaded with the various peptides and the fusion protein KIR2DL4-Ig after preincubation with mem147 (c). The vertical dotted line (a and b) indicates staining of acid-treated cells without peptides. The phosphorylated serine residues are indicated by plus signs, whereas nonphosphorylated peptides are indicated by minus sings, and the numbers indicates the position of the serine residue within the peptide. 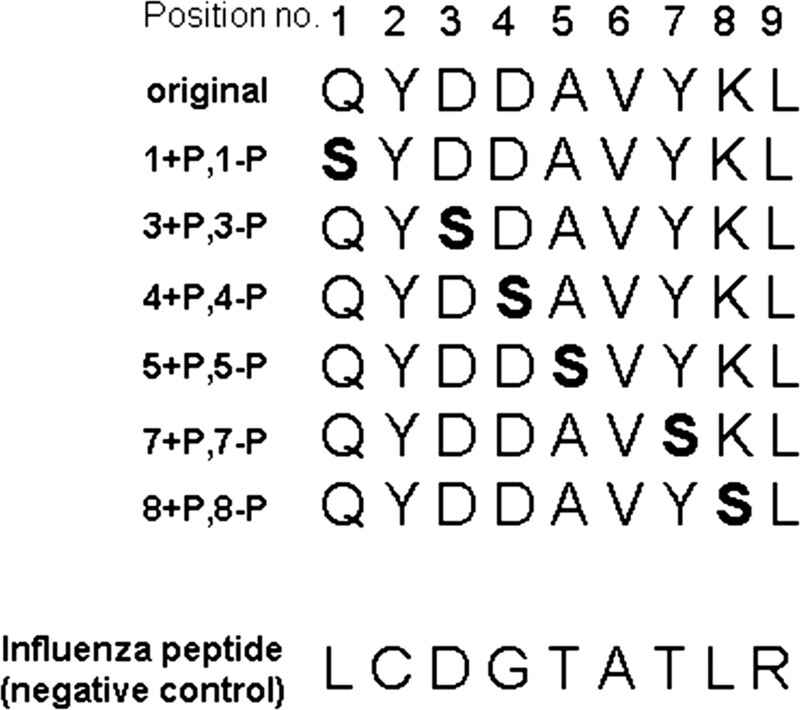 The bar marked original represents the consensus peptide, the one marked control is the influenza peptide, and the one marked no pep represents no peptide. Shown is the average MFI of five experiments. As a control for the KIR2DL1-Ig, we tested the fusion protein KIR2DL4-Ig on 221.Cw4 cells loaded with the various peptides (Fig. 4⇑c).The KIR2DL4 receptor binds HLA-G only, and we therefore detected a very minimal binding of KIR2DL4-Ig to the cells, thus indicating that the KIR2DL1-Ig binding is specific. In summary, our data show that the binding of the soluble KIR2DL1 receptor to HLA-Cw4 is not only dependent on the presence of a peptide but that it is also sensitive to the phosphorylation state of the peptide side chain. Our next question was whether the observed differences in the binding efficiency of KIR2DL1 receptor are meaningful and whether similar differences would be observed in functional assays. To exclude any contribution of other NK receptors in the peptide-sensitive recognition of HLA-Cw4, we used the YTS cells transfected with KIR2DL1 (YTS-KIR2DL1) for the cytotoxicity assays instead of bulk NK cultures. YTS cells that express KIR2DL1 were generated as described previously (24, 25). As previously reported (24), an efficient inhibition of the killing mediated by YTS-KIR2DL1 cells was observed when 221.Cw4 cells were used (Fig. 5⇓a). This inhibition resulted from the KIR2DL1 interaction with 221.Cw4, because it was abolished by preincubation with the anti-KIR2DL1 HP3E4 mAb (Fig. 5⇓b). In agreement with the binding results presented in Fig. 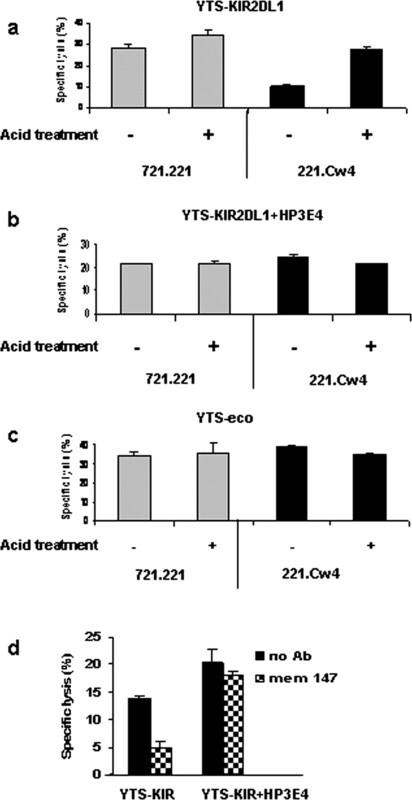 2⇑, after acid treatment YTS-KIR2DL1 cells were no longer inhibited by the 221.CW4 transfectants, and lysis was fully restored to levels similar to those of the parental 721.221 cells (Fig. 5⇓a, filled bars). The differences in the killing between acid-treated 721.221 cells and nontreated cells were not statistically significant (Fig. 5⇓a, gray bars). In addition, the overall killing of the target cells was not affected because of the acid treatment itself, and YTS cells expressing the control ecotropic receptor (YTS-eco) or YTS-KIR2DL1 cells in which KIR was blocked (with HP3E4) killed all cells (treated or not treated) equally (Fig. 5⇓, b and c). In agreement with the binding results presented in Fig. 2⇑, preincubation of 221.Cw4 cells with the mem147 mAb that increased the binding also increases the inhibition, and this inhibition was abolished by the HP3E4 mAb (Fig. 5⇓d). We next tested the effect of the various peptides on the inhibition by KIR2DL1. No inhibition was observed when no peptide was present or when the control peptide was loaded on the 221.Cw4-treated cells (Fig. 6⇓), in agreement with the little or no binding by KIR2DL1-Ig (Fig. 6⇓). A direct correlation was observed between the KIR2DL1-Ig binding and the inhibition of the killing. The original peptide that was recognized most efficiently by KIR2DL1-Ig confers an efficient protection (compare Figs. 4⇑b and 6). Substitution by a serine residue at positions 1–5 had no significant inhibition on the inhibition of killing; indeed, the binding of KIR2DL1-Ig was more or less equivalent among these peptides (compare Figs. 4⇑b and 6). The only exception was observed in position 4; including a serine residue at this position resulted in efficient inhibition, and this inhibition was not correlated with the KIR2DL-1-Ig binding (Fig. 6⇓). 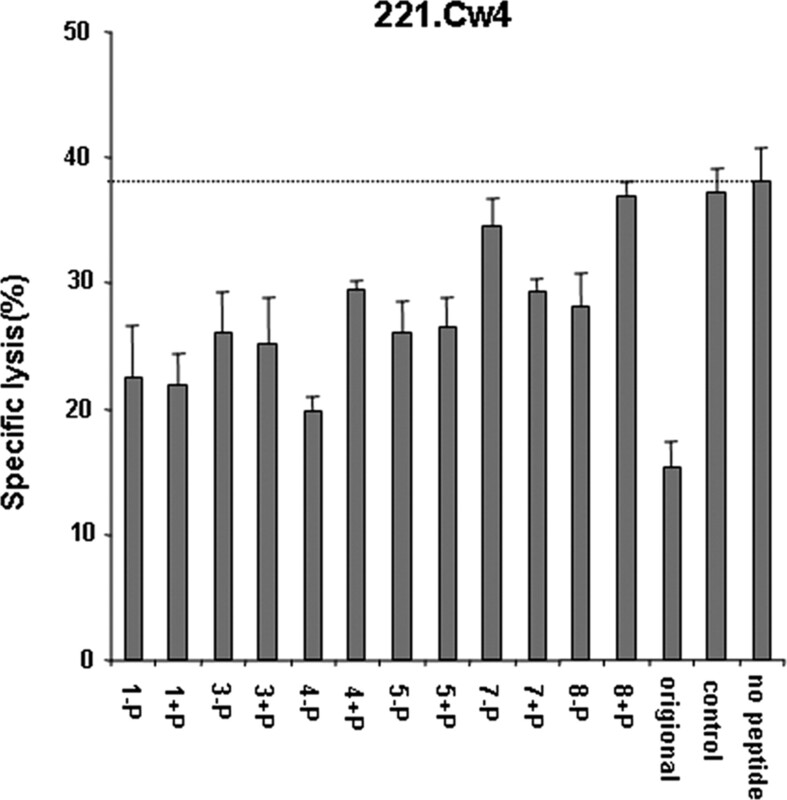 Recognition and lysis of peptide-stabilized HLA-Cw4 by YTS-KIR2DL1. 221.Cw4 cells were treated with acid, incubated with the various peptides (100 μM), and tested for lysis by YTS-KIR2DL1 (gray bar). The horizontal dotted line indicates staining of acid-treated cells without peptides. The phosphorylated serine residues are indicated by plus signs, whereas nonphosphorylated peptides are indicated by minus signs, and the numbers indicate the position of the serine residue within the peptide. The bar marked original represents the consensus peptide without any changes, and control is the influenza peptide. The E:T presented was 5:1, and the average of three killing experiments is shown. Replacing the original residue with a serine residue at position 7 resulted in a complete abrogation of KIR2DL1-Ig binding and, consequently, no inhibition was observed whereas the phosphorylation of this serine residue resulted in modest KIR2DL1-Ig binding and a slight gain of inhibition. Serine phosphorylation at position 8, which resulted in a complete loss of KIR2DL1-Ig binding, resulted in no inhibition of YTS-KIR2DL1 killing. The killing of all cells loaded with peptides by the control YTS-eco cells was similar (data not shown). In conclusion, we demonstrate here that modifications, such as phosphorylation in the presented peptides of the MHC class I proteins, can affect recognition by the KIR2DL1 receptor. It was demonstrated previously (29, 30) that cells under stress up-regulate the ligands for NKG2D. We next wanted to verify whether acid treatment of the 721.221 cells would result in the appearance of stress-induced ligands. Cells were treated with acid as described above, and specific Abs or fusion proteins were used to detect elevations in the expression of activating ligands on the cell surface. 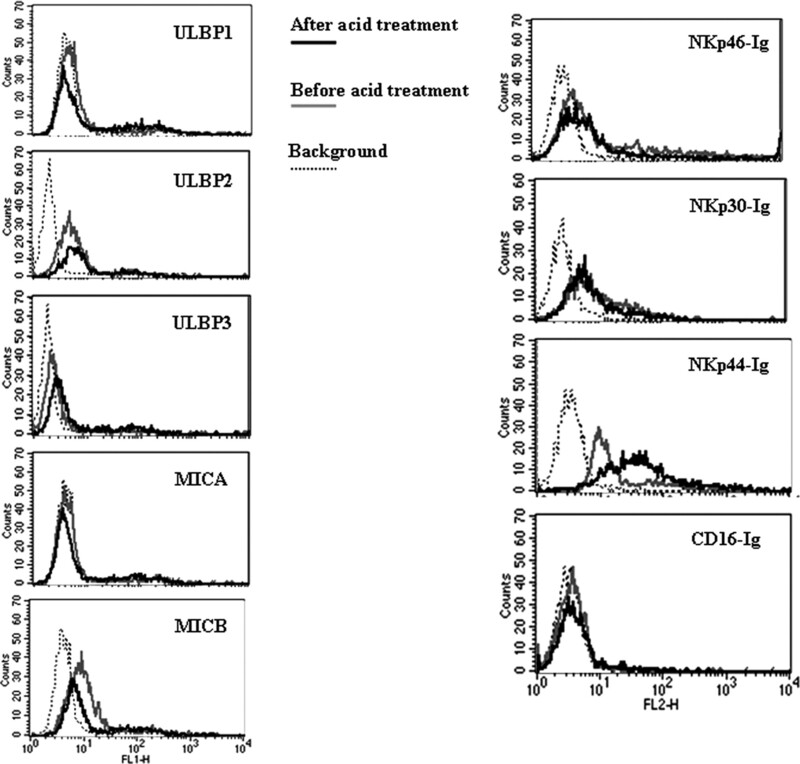 No increase in the expression of the NKG2D ligands ULBP1–3 and MHC class I-related chain A and B was observed before and after acid treatment (Fig. 7⇓). Acid treatment of 221.Cw4 cells resulted in enhanced binding of NKp44-Ig. 221.Cw4 cells were treated with acid and immediately tested for surface expression of ligands for the activating receptors using mAb against MHC class I-related chain A and B and ULBP1–3 or using the fusion proteins NKp46-Ig, NKp30-Ig, NKp44-Ig, and CD16-Ig. Shown are FACS histograms from one representative experiment of three performed. Because no cellular ligands have been identified to date for the NK-activating receptors, we used fusion proteins of the activating receptors (NKp46, NKp30, NKp44, and CD16) made of the extracellular portion of each of the activating NK receptors fused to human IgG1 (25). The NKp46-Ig, NKp30-Ig, and CD16-Ig showed no difference in the binding before and after acid treatments, but the binding of NKp44-Ig was slightly increased after acid treatment. It is therefore possible that ligands for NKp44 might be expressed in.221 cells after treatment with acid. Because the NKp44 receptor did not function on YTS cells (data not shown), it does not play a role in the results presented in this study. The lack of change in NKp46-Ig, NKp30-Ig, and CD16-Ig binding along with lack of change in NKG2D ligands (Fig. 7⇑) verify that none of these major NK lysis receptors are affected by the acid treatment. The presented peptide in the groove of the MHC class I molecule is crucial for immune responses. CTL recognition of hazardous cells depends on the expression of MHC class I loaded with foreign peptides derived mainly from tumor Ags or viral products (31). In contrast, interaction of the NK inhibitory receptors with the bound peptide in the MHC class I molecule leads to inhibition of the killing by NK cells, whereas loss of MHC class I results in NK activation and killing by specific receptors (32). The KIR2DL1 receptor is one of the major NK inhibitory receptors recognizing HLA-C proteins characterized by the presence of lysine at position 80 (17). In this study, we show that posttranslational modifications, such as phosphorylation of the presented peptide found in the groove, alter the ability of NK to recognize MHC class I molecules and initiate protection from lysis by NK cells. Phosphorylation is a tightly regulated posttranslational cytosolic event. It was previously demonstrated that phosphopeptides could be used to elicit CTL responses and that CTLs could discriminate between phosphorylated and nonphosphorylated peptides (26, 33), but the effect of peptide phosphorylation on NK inhibition was never investigated. We demonstrated in this work that by adding a peptide we can stabilize the MHC complex, and the binding of KIR2DL1-Ig was consequently increased. However, differences in the binding potency were observed among the various peptides depending on the phosphorylation sites. We observed that serine phosphorylation in position 8 and the serine residue at position 7 reduced the binding of KIR2DL1-Ig and, consequently, reduced the inhibition of the killing. Previous studies (20) demonstrated that when the residues at positions 7 and 8 of the presented peptide are negatively charged, the binding of the KIR2DL1 receptor is weaker. It was also demonstrated that residues at positions 7 and 8 in the bound peptides are important for the inhibition (34) and that substitution of position 8 with basic amino acids had an inhibitory effect (23). These results correlate with our observations, because when the serine residue at position 8 was phosphorylated we observed a dramatic decrease in the binding of KIR2DL1 and, consequently, decreased inhibition of the killing. We do not completely understand why the presence of serine at position 4 of the bound peptide resulted in reduced inhibition. We observed this surprising result in all of our experiments. Our results are in agreement with the solved crystal structure of HLA-Cw4 and KIR2DL1, where minimal contact was observed between the peptide and the KIR2DL1-MHC complex, and the direct contact was shown to be limited to the COOH-terminal portion of the presented peptide (22). Peptide phosphorylation might occur in various processes such as inflammation, intracellular infection, cellular activation, and malignant transformation may cause deregulation of phosphorylation, perhaps leading to generation of sufficient amounts of phosphopeptides for class I MHC-restricted presentation to occur. There are several examples of viral and tumor proteins that are phosphorylated because of virus infection and tumor transformation. It is known that the structural phosphoprotein (P protein) of the respiratory syncytial virus is phosphorylated at serine residues in two regions, a central region and another region of serine residues located near the C terminus, which are also modified during virus infection (35). In addition, following the chromosomal translocation (the Philadelphia chromosome) that is associated with all chronic myeloid leukemia cases (36), the c-abl protooncogene becomes activated by its translocation to chromosome 22 to produce the fusion protein BCR-ABL. Only this fusion protein exhibits tyrosine kinase activity that results in autophosphorylation and tyrosine phosphorylation of other cellular proteins. Finally, there are known viral phosphoproteins such as the EBV protein ENBA-2 that has phosphorylation at Ser469 and Ser470 (37), EBV latent membrane protein 1 at Ser313 and Thr324 (38), and EBV BZLF1 at Ser173 (39). Indeed, phosphorylated peptides could be directly purified from MHC molecules derived from several different EBV-transformed B lymphoblastoid cell lines, exposing the repertoire of naturally processed and phosphorylated peptides that are presented by MHC class I molecules (26). The killing activity of NK cells is balanced by inhibitory and activating signals (40, 41). Therefore, changes in these signals, which are coming directly from the target cells, will determine the fate of these cells. Normal cells, which express normal levels of MHC class I proteins and probably almost no ligands for the NK activating receptors, would be protected from NK killing. We know today that upon stress such as viral infection or tumor development these hazardous cells up-regulate ligands for NKG2D (42, 43) and the natural cytotoxicity receptor (44, 45, 46). In some of these situations the MHC class I level is reduced. However, there are many hazardous cells in which the levels of MHC class I proteins remain unchanged. In such situations it might be possible that the amount of the phosphorylated peptides in the groove of the MHC class I proteins would reduce the recognition by the NK inhibitory receptors, thus shifting the balance toward activation and killing of the “dangerous” cells by NK cells. ↵1 O.M. is supported by research grants from the United States-Israel Binational Science Foundation and the Israel Science Foundation and by European Commission Grant QLK2-CT-2002-011112. ↵3 Abbreviations used in this paper: KIR, killer cell Ig-like receptor; KIR2D, KIR with two extracellular Ig-like domains; KIR2DL1, KIR2D having a long cytoplasmic domain with a ITIM sequence; β2m, β2-microglobulin; MFI, mean fluorescence intensity; eco, ecotropic receptor. Trinchieri, G.. 1989. Biology of natural killer cells. Adv. Immunol. 47: 187-376. Bottino, C., R. Biassoni, R. Millo, L. Moretta, A. Moretta. 2000. The human natural cytotoxicity receptors (NCR) that induce HLA class I-independent NK cell triggering. Hum. Immunol. 61: 1-6. Colonna, M., G. Borsellino, M. Falco, G. B. Ferrara, J. L. Strominger. 1993. HLA-C is the inhibitory ligand that determines dominant resistance to lysis by NK1- and NK2-specific natural killer cells. Proc. Natl. Acad. Sci. USA 90: 12000-12004. Cella, M., A. Longo, G. B. Ferrara, J. L. Strominger, M. Colonna. 1994. NK3-specific natural killer cells are selectively inhibited by Bw4-positive HLA alleles with isoleucine 80. J. Exp. Med. 180: 1235-1242. Wagtmann, N., S. Rajagopalan, C. C. Winter, M. Peruzzi, E. O. Long. 1995. Killer cell inhibitory receptors specific for HLA-C and HLA-B identified by direct binding and by functional transfer. Immunity 3: 801-809. Verbrugge, A., T. de Ruiter, H. Clevers, L. Meyaard. 2003. Differential contribution of the immunoreceptor tyrosine-based inhibitory motifs of human leukocyte-associated Ig-like receptor-1 to inhibitory function and phosphatase recruitment. Int. Immunol. 15: 1349-1358. Stern, N., G. Markel, T. I. Arnon, R. Gruda, H. Wong, S. D. Gray-Owen, O. Mandelboim. 2005. Carcinoembryonic antigen (CEA) inhibits NK killing via interaction with CEA-related cell adhesion molecule 1. J. Immunol. 174: 6692-6701. Markel, G., H. Achdout, G. Katz, K. L. Ling, M. Salio, R. Gruda, R. Gazit, S. Mizrahi, J. Hanna, T. Gonen-Gross, et al 2004. Biological function of the soluble CEACAM1 protein and implications in TAP2-deficient patients. Eur. J. Immunol. 34: 2138-2148. Markel, G., N. Lieberman, G. Katz, T. I. Arnon, M. Lotem, O. Drize, R. S. Blumberg, E. Bar-Haim, R. Mader, L. Eisenbach, O. Mandelboim. 2002. CD66a interactions between human melanoma and NK cells: a novel class I MHC-independent inhibitory mechanism of cytotoxicity. J. Immunol. 168: 2803-2810. Assarsson, E., T. Kambayashi, C. M. Persson, B. J. Chambers, H. G. Ljunggren. 2005. 2B4/CD48-mediated regulation of lymphocyte activation and function. J. Immunol. 175: 2045-2049. Eissmann, P., L. Beauchamp, J. Wooters, J. C. Tilton, E. O. Long, C. Watzl. 2005. Molecular basis for positive and negative signaling by the natural killer cell receptor 2B4 (CD244). Blood 105: 4722-4729. Miller, J. D., D. A. Weber, C. Ibegbu, J. Pohl, J. D. Altman, P. E. Jensen. 2003. Analysis of HLA-E peptide-binding specificity and contact residues in bound peptide required for recognition by CD94/NKG2. J. Immunol. 171: 1369-1375. Colonna, M., J. Samaridis. 1995. Cloning of immunoglobulin-superfamily members associated with HLA-C and HLA-B recognition by human natural killer cells. Science 268: 405-408. Wagtmann, N., R. Biassoni, C. Cantoni, S. Verdiani, M. S. Malnati, M. Vitale, C. Bottino, L. Moretta, A. Moretta, E. O. Long. 1995. Molecular clones of the p58 NK cell receptor reveal immunoglobulin-related molecules with diversity in both the extra- and intracellular domains. Immunity 2: 439-449. Dohring, C., D. Scheidegger, J. Samaridis, M. Cella, M. Colonna. 1996. A human killer inhibitory receptor specific for HLA-A1,2. J. Immunol. 156: 3098-3101. Mandelboim, O., H. T. Reyburn, M. Vales-Gomez, L. Pazmany, M. Colonna, G. Borsellino, J. L. Strominger. 1996. Protection from lysis by natural killer cells of group 1 and 2 specificity is mediated by residue 80 in human histocompatibility leukocyte antigen C alleles and also occurs with empty major histocompatibility complex molecules. J. Exp. Med. 184: 913-922. Winter, C. C., E. O. Long. 1997. A single amino acid in the p58 killer cell inhibitory receptor controls the ability of natural killer cells to discriminate between the two groups of HLA-C allotypes. J. Immunol. 158: 4026-4028. Rock, K. L., S. Gamble, L. Rothstein, C. Gramm, B. Benacerraf. 1991. Dissociation of β 2-microglobulin leads to the accumulation of a substantial pool of inactive class I MHC heavy chains on the cell surface. Cell 65: 611-620. Rajagopalan, S., E. O. Long. 1997. The direct binding of a p58 killer cell inhibitory receptor to human histocompatibility leukocyte antigen (HLA)-Cw4 exhibits peptide selectivity. J. Exp. Med. 185: 1523-1528. Zappacosta, F., F. Borrego, A. G. Brooks, K. C. Parker, J. E. Coligan. 1997. Peptides isolated from HLA-Cw*0304 confer different degrees of protection from natural killer cell-mediated lysis. Proc. Natl. Acad. Sci. USA 94: 6313-6318. Fan, Q. R., E. O. Long, D. C. Wiley. 2001. Crystal structure of the human natural killer cell inhibitory receptor KIR2DL1-HLA-Cw4 complex. Nat. Immunol. 2: 452-460. Mandelboim, O., S. B. Wilson, M. Vales-Gomez, H. T. Reyburn, J. L. Strominger. 1997. Self and viral peptides can initiate lysis by autologous natural killer cells. Proc. Natl. Acad. Sci. USA 94: 4604-4609. Katz, G., G. Markel, S. Mizrahi, T. I. Arnon, O. Mandelboim. 2001. Recognition of HLA-Cw4 but not HLA-Cw6 by the NK cell receptor killer cell Ig-like receptor two-domain short tail number 4. J. Immunol. 166: 7260-7267. Achdout, H., T. I. Arnon, G. Markel, T. Gonen-Gross, G. Katz, N. Lieberman, R. Gazit, A. Joseph, E. Kedar, O. Mandelboim. 2003. Enhanced recognition of human NK receptors after influenza virus infection. J. Immunol. 171: 915-923. Zarling, A. L., S. B. Ficarro, F. M. White, J. Shabanowitz, D. F. Hunt, V. H. Engelhard. 2000. Phosphorylated peptides are naturally processed and presented by major histocompatibility complex class I molecules in vivo. J. Exp. Med. 192: 1755-1762. Falk, K., O. Rotzschke, B. Grahovac, D. Schendel, S. Stevanovic, V. Gnau, G. Jung, J. L. Strominger, H. G. Rammensee. 1993. Allele-specific peptide ligand motifs of HLA-C molecules. Proc. Natl. Acad. Sci. USA 90: 12005-12009. Sidney, J., M. F. del Guercio, S. Southwood, V. H. Engelhard, E. Appella, H. G. Rammensee, K. Falk, O. Rotzschke, M. Takiguchi, R. T. Kubo. 1995. Several HLA alleles share overlapping peptide specificities. J. Immunol. 154: 247-259. Raulet, D. H.. 2003. Roles of the NKG2D immunoreceptor and its ligands. Nat Rev Immunol. 3: 781-790. Routes, J. M., S. Ryan, K. Morris, R. Takaki, A. Cerwenka, L. L. Lanier. 2005. Adenovirus serotype 5 E1A sensitizes tumor cells to NKG2D-dependent NK cell lysis and tumor rejection. J. Exp. Med. 202: 1477-1482. Germain, R. N., D. H. Margulies. 1993. The biochemistry and cell biology of antigen processing and presentation. Annu. Rev. Immunol. 11: 403-450. Andersen, M. H., J. E. Bonfill, A. Neisig, G. Arsequell, I. Sondergaard, G. Valencia, J. Neefjes, J. Zeuthen, T. Elliott, J. S. Haurum. 1999. Phosphorylated peptides can be transported by TAP molecules, presented by class I MHC molecules, and recognized by phosphopeptide-specific CTL. J. Immunol. 163: 3812-3818. Peruzzi, M., K. C. Parker, E. O. Long, M. S. Malnati. 1996. Peptide sequence requirements for the recognition of HLA-B*2705 by specific natural killer cells. J. Immunol. 157: 3350-3356. Villanueva, N., J. Navarro, E. Mendez, I. Garcia-Albert. 1994. Identification of a protein kinase involved in the phosphorylation of the C-terminal region of human respiratory syncytial virus P protein. J. Gen. Virol. 75: 555-565.
de Klein, A., A. G. van Kessel, G. Grosveld, C. R. Bartram, A. Hagemeijer, D. Bootsma, N. K. Spurr, N. Heisterkamp, J. Groffen, J. R. Stephenson. 1982. A cellular oncogene is translocated to the Philadelphia chromosome in chronic myelocytic leukaemia. Nature 300: 765-767. Grasser, F. A., S. Gottel, P. Haiss, B. Boldyreff, O. G. Issinger, N. Mueller-Lantzsch. 1992. Phosphorylation of the Epstein-Barr virus nuclear antigen 2. Biochem. Biophys. Res. Commun. 186: 1694-1701. Moorthy, R. K., D. A. Thorley-Lawson. 1993. All three domains of the Epstein-Barr virus-encoded latent membrane protein LMP-1 are required for transformation of rat-1 fibroblasts. J. Virol. 67: 1638-1646. Kolman, J. L., N. Taylor, D. R. Marshak, G. Miller. 1993. Serine-173 of the Epstein-Barr virus ZEBRA protein is required for DNA binding and is a target for casein kinase II phosphorylation. Proc. Natl. Acad. Sci. USA 90: 10115-10119. Carayannopoulos, L. N., W. M. Yokoyama. 2004. Recognition of infected cells by natural killer cells. Curr. Opin. Immunol. 16: 26-33. Biassoni, R., C. Cantoni, D. Marras, J. Giron-Michel, M. Falco, L. Moretta, N. Dimasi. 2003. Human natural killer cell receptors: insights into their molecular function and structure. J. Cell. Mol. Med. 7: 376-387. Bahram, S., H. Inoko, T. Shiina, M. Radosavljevic. 2005. MIC and other NKG2D ligands: from none to too many. Curr. Opin. Immunol. 17: 505-509. Cerwenka, A., L. L. Lanier. 2003. NKG2D ligands: unconventional MHC class I-like molecules exploited by viruses and cancer. Tissue Antigens 61: 335-343. Mandelboim, O., N. Lieberman, M. Lev, L. Paul, T. I. Arnon, Y. Bushkin, D. M. Davis, J. L. Strominger, J. W. Yewdell, A. Porgador. 2001. Recognition of haemagglutinins on virus-infected cells by NKp46 activates lysis by human NK cells. Nature 409: 1055-1060. Arnon, T. I., H. Achdout, N. Lieberman, R. Gazit, T. Gonen-Gross, G. Katz, A. Bar-Ilan, N. Bloushtain, M. Lev, A. Joseph, et al 2004. The mechanisms controlling the recognition of tumor- and virus-infected cells by NKp46. Blood 103: 664-672.